Trim the bottom of the asparagus by breaking the stalks at their natural breaking point. Using a vegetable peeler, shave off slivers of the raw asparagus. Tear off watercress leaves from the bunch. Tear basil leaves in half if they are too big for one bite. In a mixing bowl, combine the lemon juice and the grated parmesan. Slowly pour in olive oil, whisking away, until the mixture becomes emulsified. 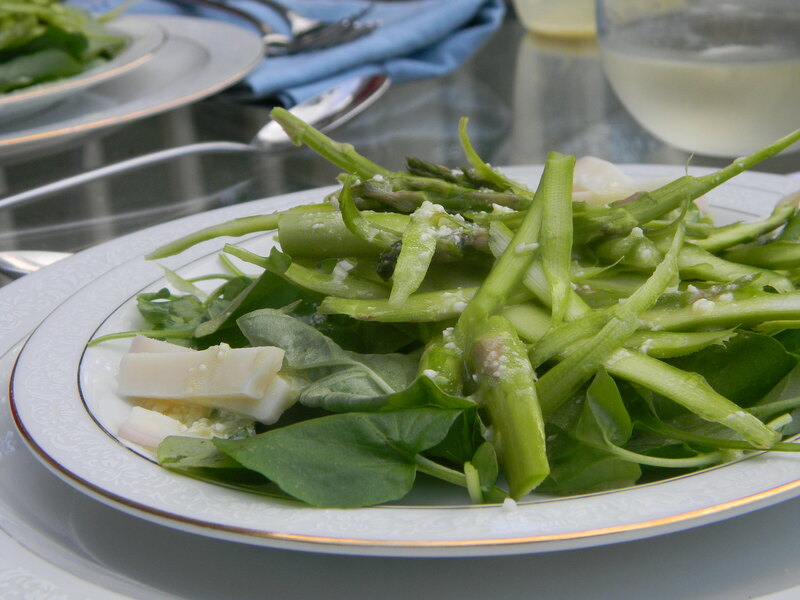 Assemble the salad: start with watercress leaves, then basil, then asparagus on top. Sprinkle the parmesan shavings over that (from the picture, you can see we actually used drunken goat cheese, not parmesan, and it was delicious as well…) Lightly dress the salad, sprinkle some finishing salt, serve, and enjoy! To the cooking store- sounds like a new necessity! Thanks Kevin! Congratulations, Gardner, on completing law school! I am sorry we missed seeing you in Atlanta last Thursday. Please let us know where your job works out! It would be so fun to have you and MK in Atlanta! I told my friend Jeannie Dyson to give you a hug for me – her daughter is one of your friends from law school. Vegetable peeler?? You MUST get an asparagus peeler! I got mine a year ago and still love it. It’s the simple things, after all, that make cooking a joy.